Attorney General cited inconsistency with "our views as a free society"
"My Father's Stand on Cuba Travel"
"Reflections by Cuba's Fidel Castro – An Impressive Gesture"
"Reflections of Fidel:Gestures that are impressive"
"Robert Kennedy tried to lift Cuba travel ban: documents"
"Anular la prohibición a estadunidenses de viajar a Cuba, pide hija de Robert F. Kennedy"
Washington D.C. April 23, 2009 - Attorney General Robert F. Kennedy sought to lift the ban on U.S. citizens traveling to Cuba in December 1963, according to declassified records re-posted today by the National Security Archive. In a December 12, 1963, memorandum to Secretary of State Dean Rusk, Kennedy urged a quick decision "to withdraw the existing regulation prohibiting such trips." Kennedy's memo, written less than a month after his brother's assassination in Dallas, argues that the travel ban imposed at the end of the Eisenhower administration was a violation of American freedoms and impractical in terms of law enforcement. Among his "principal arguments" for removing the restrictions on travel to Cuba was that freedom to travel "is more consistent with our views as a free society and would contrast with such things as the Berlin Wall and Communist controls on such travel." This document, and others relating to the first internal debate over lifting the Cuba travel ban, are quoted in an opinion piece in the Washington Post today, written by Robert Kennedy’s daughter, Kathleen Kennedy Townsend. Her article argued that President Obama should consider her father’s position and support the Free Travel To Cuba Act that has been introduced in the U.S. Congress. 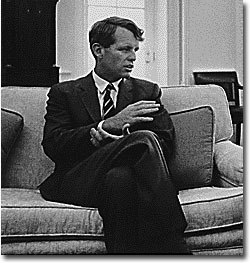 Robert Kennedy’s memo prompted what senior National Security Council officials described as "an in-house fight to permit non-subversive Americans to travel to Cuba." Several State Department officials supported Kennedy's position that "the present travel restrictions are inconsistent with traditional American liberties," and that "it would be extremely difficult to enforce the present prohibitions on travel to Cuba without resorting to mass indictments." But in a December 13, 1963 meeting at the State Department, with no representatives present from the Attorney General's office, Undersecretary of State George Ball ruled out any relaxation of regulations on travel to Cuba. A principal argument, as national security advisor McGeorge Bundy informed President Johnson in a subsequent memorandum on "Student Travel to Cuba" was that "a relaxation of U.S. restrictions would make it very difficult for us to urge Latin American governments to prevent their nationals from going to Cuba-where many would receive subversive training." The ban on travel was maintained until President Jimmy Carter lifted it in 1977; but restrictions were re-imposed during the Reagan administration and were tightened further by the Bush administration in 2004. President Obama recently announced he was lifting all restrictions on Cuban-Americans who want to travel to the island. The vast majority of U.S. citizens, however, still face stiff penalties if they travel to Cuba. The documents were found among the papers of State Department advisor Averill Harriman at the Library of Congress and in declassified NSC files at the John F. Kennedy Presidential Library in Boston. The Archive first posted them in April 2005. In a comprehensive memorandum to Secretary of State Dean Rusk, Robert Kennedy presented the arguments for legalizing travel to Cuba before a number of student groups traveled there at Christmas time. There were two courses of action, he wrote: new efforts to block increased travel to Cuba, or "to withdraw the existing regulation prohibiting such trips. The first is unlikely to meet the problem and I favor the second," Kennedy informed Rusk. In his memo he presented several arguments for lifting the travel ban: that it was a violation of American liberties to restrict free travel; that it was impractical to arrest, indict and engage in "distasteful prosecutions" of scores of U.S. citizens who sought to go to Cuba; and that lifting the travel ban was likely to diminish the attraction of leftists who were organizing protest trips to Havana. "For all these reasons I believe that it would be wise to remove restrictions on travel to Cuba before we are faced with problems which are likely to be created in the immediate future." Two State Department officers, legal advisor Abram Chayes and Abba Schwartz summarize Kennedy's arguments that "the ban on travel to Cuba be removed immediately," including that "the present travel restrictions are inconsistent with traditional American liberties." They note that lifting restrictions to Cuba is likely to be undertaken in the context of lifting most travel restrictions to other nations. They support Kennedy's proposal but favor passport validation which would require those who travel to apply for permission from the Secretary of State to go to Cuba. This memo, written by the NSC's Latin American specialist Gordon Chase to national security advisor McGeorge Bundy, reveals that the Attorney General's proposal has been overruled at the State Department. At a meeting on December 13, to which Justice department officials were not invited, State Department officials from the Latin American division successfully argued that lifting the ban would compromise U.S. pressures on other nations in the hemisphere to isolate Cuba and block students from traveling there. In addition, according to Chase, Abba Schwartz believed that Lyndon Johnson could not politically afford to lift the ban because it would "make him look unacceptably soft." The State Department's attention turns to steps the government can take to prevent U.S. students from violating the ban and traveling to Cuba. In an options memorandum for President Johnson, McGeorge Bundy informs him of the continuing debate over lifting restrictions on travel to Cuba. As summer begins, the administration expects about 100 students to try and travel to Cuba. Bundy lays out the "two distinct schools of thought" on the travel issue: Robert Kennedy's effort to end controls on the basis of "our libertarian tradition and the difficulty of controlling travel" and current U.S. policy which is built on a tough line toward Cuba and efforts to enlist other Latin American nations to isolate Cuba politically and culturally, and to "prevent their nationals from going to Cuba." Bundy correctly assumes that President Johnson does not want to relax controls on travel to Cuba and informs him that an interagency group is studying ways to further "reduce the interest in and to control student travel to Cuba this summer."